When I bought the No Bones About It stamp set, it was really just for my boys to stamp with. They love to make cards and I didn’t really expect to use it much. Today, The Stamp Review Crew are showcasing No Bones About It so I had to put my thinking cap on and come up with an idea. 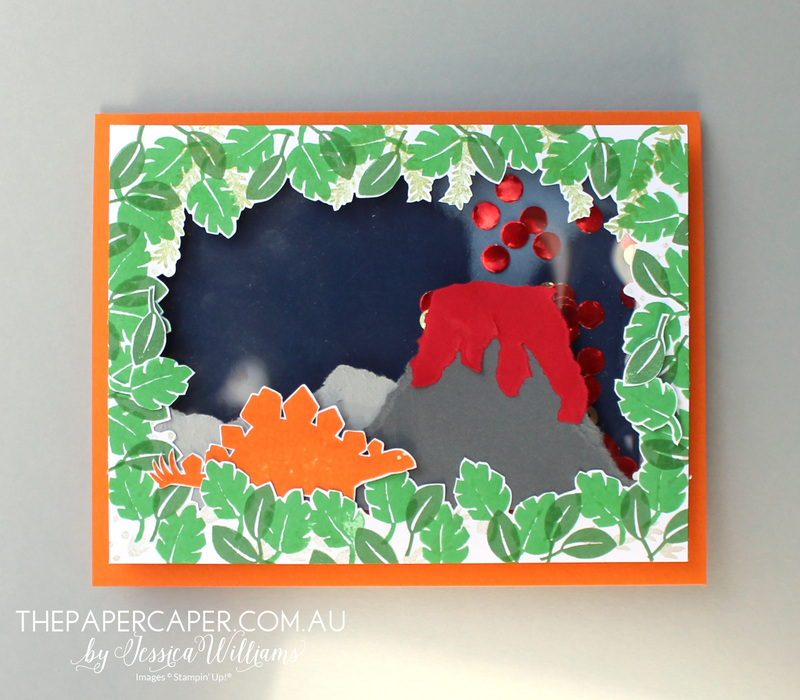 Recently there’s been a bit of a craze for shaker cards and I thought it would be really cool to create a dinosaur scene with a volcano, errupting with bits and pieces. So I set about making it. I went for a torn paper look for my background. I wanted to keep it simple for the little boys in my life. One of them makes quite a few torn paper collages so I thought I’d take some inspiration from him. I added my volcano and a couple of other distant mountains. 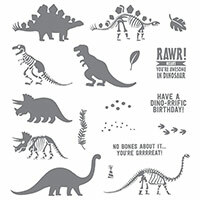 There wasn’t much room for dinosaurs in the end but I chose a stegosaurus. I think they’re my favourite. I wanted to include some foliage but wasn’t sure how until I decided to make a frame for the scene. Once the design was done, I added some foam strips to the back. I’ve rigged it so that the shaker bits will come out of the volcano and there’s a little foam path for them to fall to the bottom and go back into the volcano. My Mr 7 then helped me punch some tiny Red Foil and Red Glimmer Paper circles (from the Owl Builder Punch) and we loaded our volcano. The last step was to mount it onto the card and give it a whirl. My three little misters love it. I’m not sure that the torn paper primitive look is very ‘me’, but this was a fun one to make! Make sure you visit Tanya Boser to see more No Bones About It inspiration! Need to go back? Visit Yapha Mason if you’re hopping in reverse! That’s amazing!! 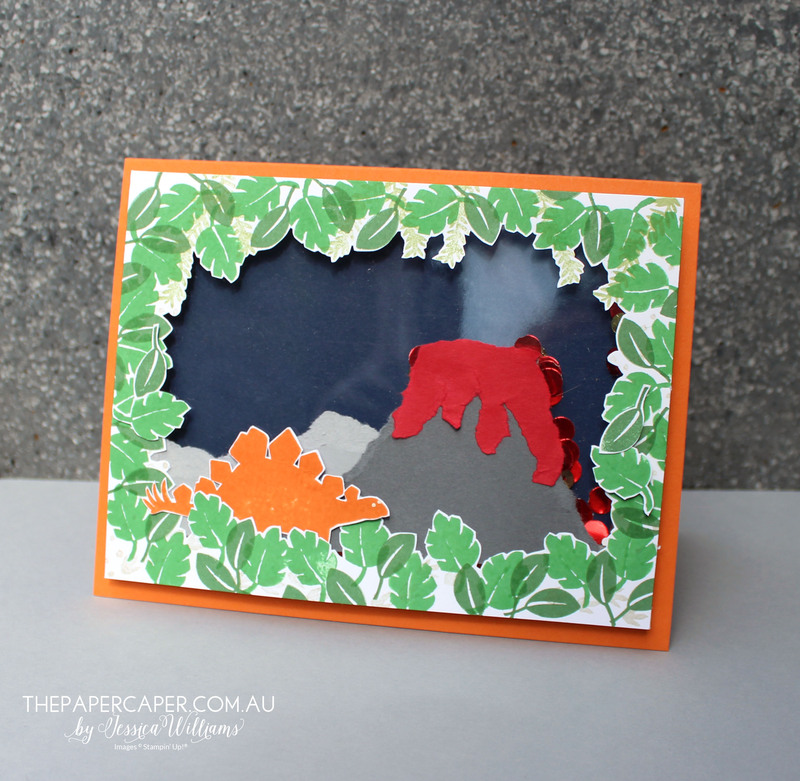 I love your volcano — so clever to make it a shaker card! And that foliage frame is fabulous. Cool shaker card. The volcano with red sequins is a great touch. This is amazing, Jessica! I love it! You were so, so clever with this card and it’s fantastic! Ooo, a shaker volcano! And a cute dino, such a great card!!! What a great idea for a shaker card! Very creative.